El Carmen Los Realejos with seafarers a must see. 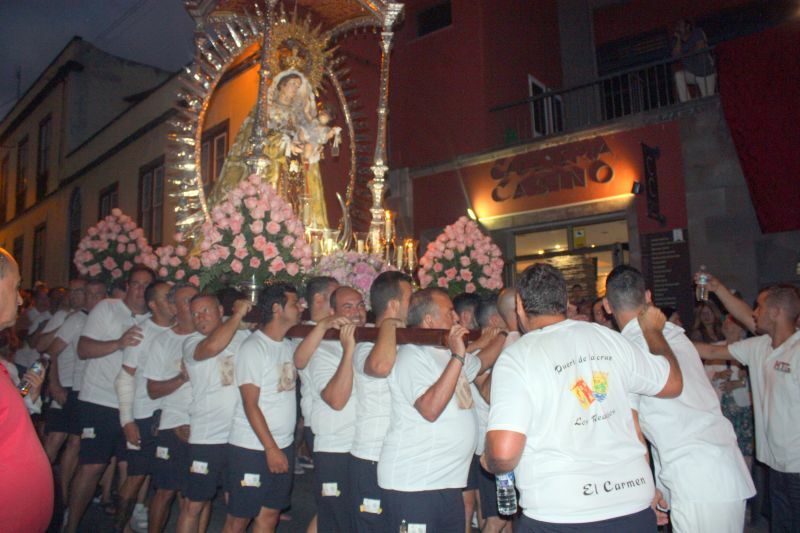 El Carmen is an event of Los Realejos which is better known in the world of seafarers as Stella Maris. Stella of the oceans represents their patroness. El Carmen emblematic t-shirt that was made for the religious festival. 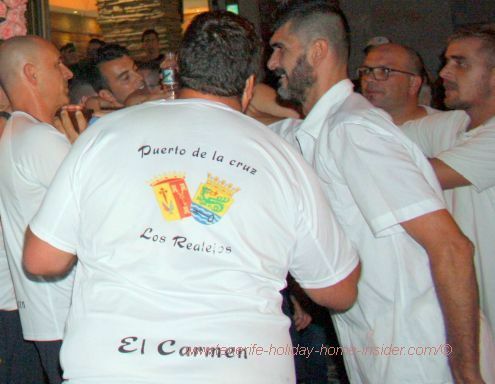 The t-shirt depicted above represents the brotherhood between Los Realejos and the so called Marinos the seamen of Puerto de la Cruz in Tenerife North. 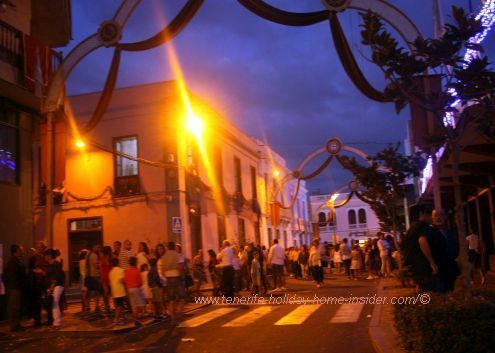 The latter are the highlight of this important event of the Orotava Valley. The garment shows the flags of the two towns together with the word El Carmen in unison. In fact, the patroness of the oceans and of all marine trade has created a strong bond between the two important municipalities for almost two centuries. This never ended when the seafarer guilds of Puerto Cruz received their own Marian statue, as you can read up here. Why stop something that also had become great fun? 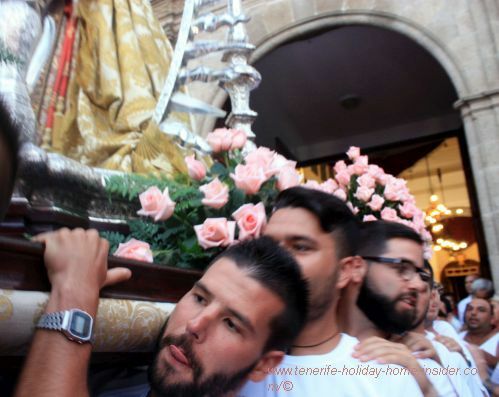 So the yearly pilgrimage to the religious festival by Puerto's seamen the Marinos went on year after year like all good Spanish traditions. Spanish traditions Puerto Cruz and Realejos. Viva Virgen del Carmen chants at Stella Maris Realejos. The long track up the hills from el Puerto their port continues to be worth it. 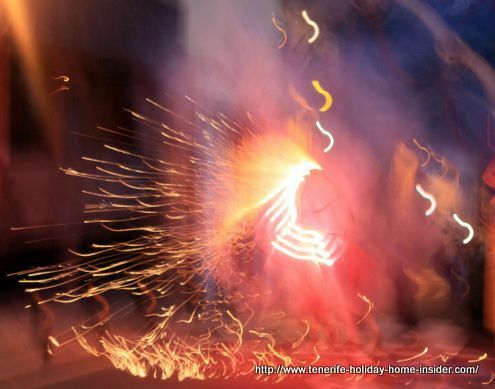 A totally unexpected Fiesta del Carmen experience. On Sunday July 23, I took part in the church ceremony before the Marian procession. The spacious hall style building was packed with people. Many stood in the back and in the aisles. Then, there were the devotees who looked down from the alcoves of the Hall style church. The alcoves are on first floor galleries. They line both sides of church Iglesia of Our Lady of Carmel. Large floating, red rugs trailed down from many of them. Vintage theater look of the Santuary of Releajos. Church hall architecture without people. I felt like in a vintage theater or an old opera house with the spectacles that developed during that mass. 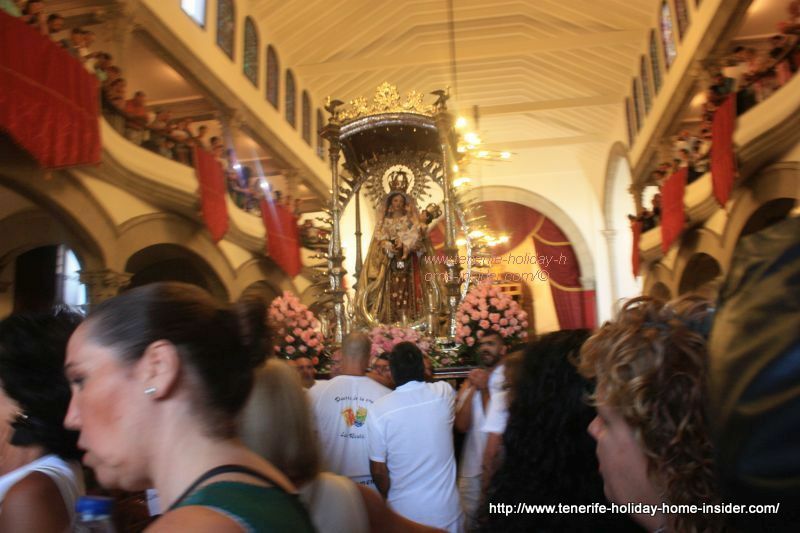 The chants of the most famous choir of the Canary Islands the Sabandeños added to the special feel. It was heavenly, indeed. Even the sermon was a success, as the good acoustics of this temple seem to be extraordinary. Later, a sudden noise surged all of a sudden during a moment of silence after the Holy Communion. It was like a thunderous uproar. There also was this chant which didn't quite seem to fit. A guy with a green t-shirt who had been disturbingly noisy in the back of the church left together with a sturdy tall companion. They came back immediately. The seafarers from Puerto made their appearance in a rather unruly manner. They seemed to push and to shovel. The ladies that sat facing the red carpet like i did pulled back their feet. So did I. Were we going to be trampled down? The man with green shirt appeared again. Nobody harmed us. 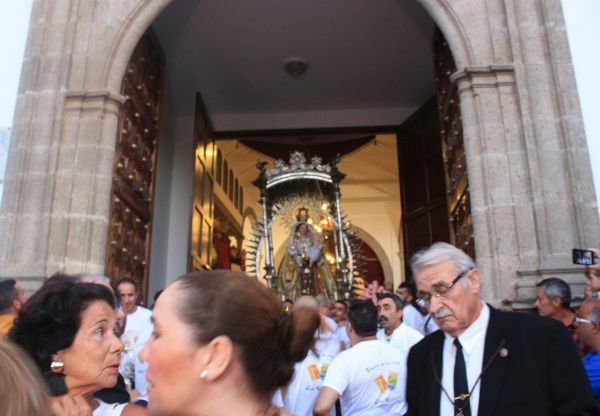 Marinos approaching from their pilgrimage to the Realejos hills del Carmen. The chap in green made them all go onto their knees. 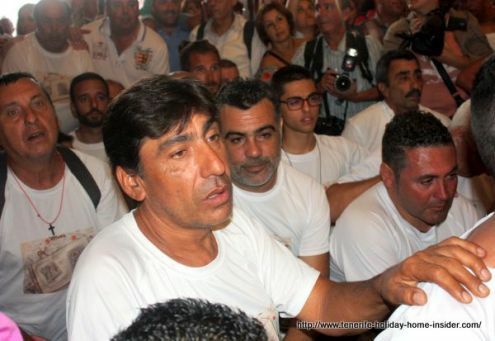 Seamen proceeding on their knees. 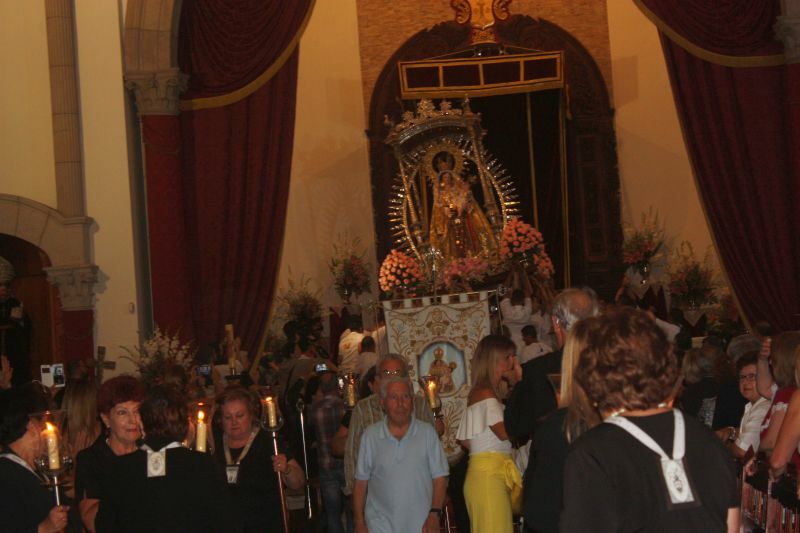 Commotion by the altar where Marinos take down the Madonna, onto their shoulders. Their Carmen t-shirts stood out prominently. Another group joined up with the first. 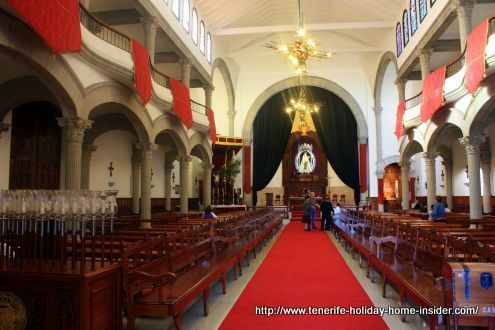 All slid forward slowly on the red carpet to the Madonna shrine at the principal part of the church. She still stood high up behind the main altar. More people approached it to take photos. The commosion was unreal. It made it impossible for me to take a good camera shot. Next - The street stage of the festival procession. 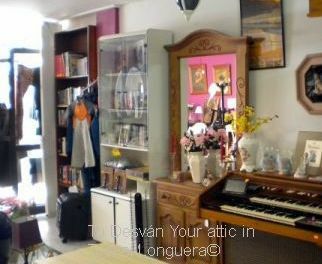 Calle Alhondiga of San Agustin. The first and longest track went along the street Calle Alhondiga.The seafarers took their patroness past the Casino of Los Realejos. Just after that point, one of most innovative Pyrotechnica innovations was put into action. Something that looked like made of metal and with the size of an ancient water wheel stood like a street stopper. Explosives were spaced out on it. 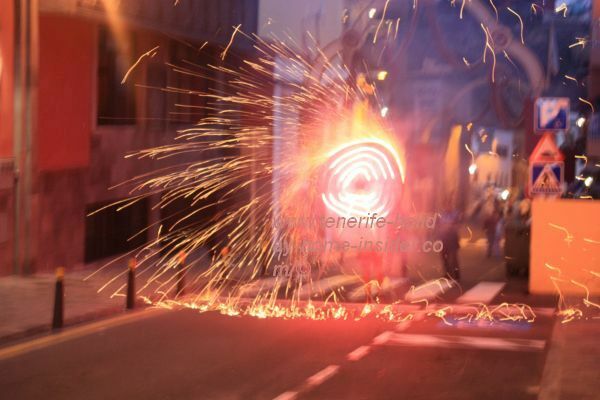 Needless to say, this was real street art when the wheel started spinning and the fireworks went off. Then the men took on their Calvario. 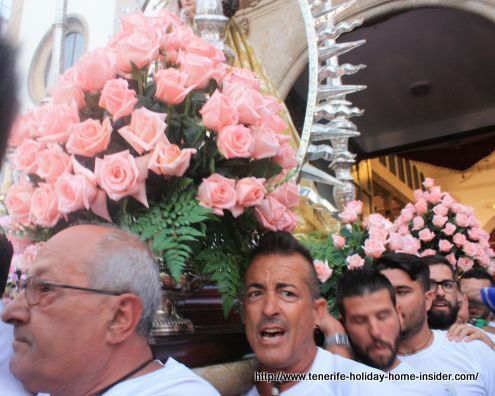 They carried the heavy load up the extremely steep road Calle La Virgen. 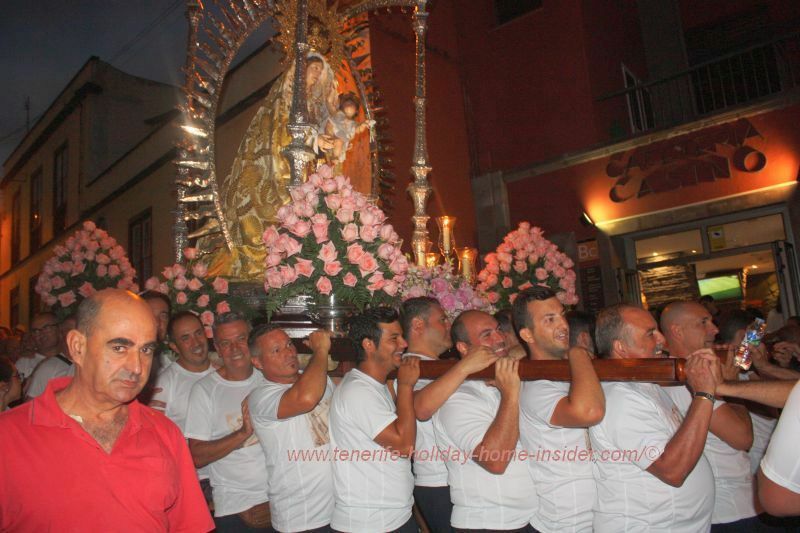 On top, they turned left into Calle San Agustin to bring their Stella Maris back to her base in church. From El Carmen back to Los Realejos. More photos and some videos by Facebook Los Realejos here.